Home » Music » Get Hip! Get the blues, soul-blues, jump-blues, Americana and more that are all happening this month along with special events like Playing With Fire and In the Market for Blues! The Blues Society of Omaha (BSO) partners with Jazz on the Green to present former Omahan and world-class blues vocalist Shaun Murphy Thursday, Aug. 2, 7:30 p.m. in celebration of the BSO’s 20th Anniversary. Murphy’s credits include working regularly in the studio and on tour as a backing vocalist for artists including Bob Seger and Eric Clapton. Murphy was the female lead vocalist for Little Feat from 1993-2009 when she left to start working under her own name. See shaunmurphyband.com. The weekly BSO Presents Thursday 6-9 p.m. series at Chrome Lounge features Polly O’Keary & The Rhythm Method Thursday, Aug. 9. Multiple Blues Music Award winner and one of the most distinctive and heartfelt soul-blues vocalists of his generation, Curtis Salgado is back Thursday, Aug. 16. Salgado is touring behind the stripped down, acoustic-oriented deep blues record he released in early 2018 with acclaimed guitarist Alan Hager, Rough Cut (Alligator Records). 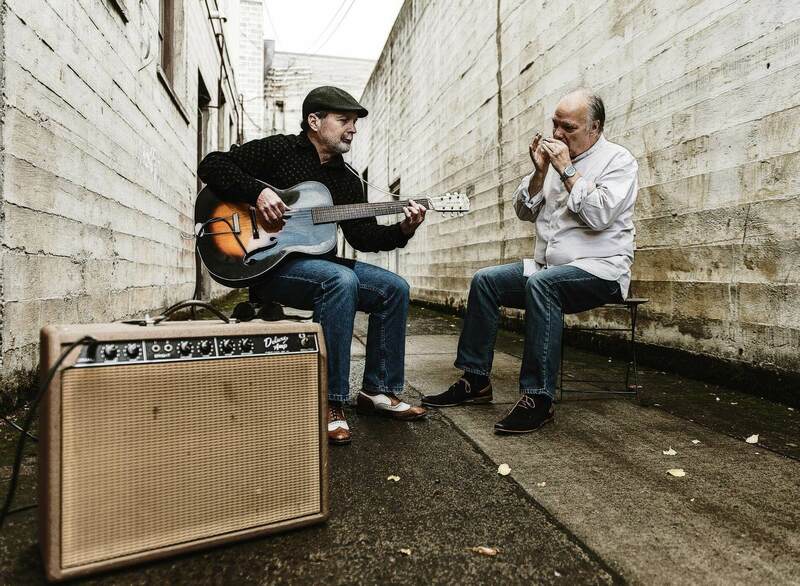 The duo have been jamming around their Portland, Ore., hometown for years and Hager joined the Salgado band in 2015, bringing his excellent taste and tone to Salgado’s sets. As Salgado likes to say as he launches into high gear with his always phenomenal band, “Are you with us, music lovers?” This full-band show will deliver soul, celebration and plenty of grooves for dancing plus some tunes that showcase work from Salgado and Hager’s duo disc. Anthony Gomes plugs in Thursday, Aug. 23. The phenomenal Cate Brothers are back with their great musicianship and soulful sound Thursday, Aug. 30. Vocalist Reneé Austin performs Thursday, Sept. 6. The Minneapolis-area-based vocalist returned to the stage in 2015 after complications from a 2005 thyroid surgery left her unable to sing for a decade. See OmahaBlues.com. The August edition of Playing With Fire takes over Midtown Crossing Saturday, Aug. 25, 4:30 p.m., with headliner, Juno Award-winner, vocalist and harmonica player Paul Reddick. Also performing are Blackie & The Rodeo Kings featuring Colin Linden and Omaha’s own Matt Cox. See playingwithfireomaha.net. Shows of note at Lincoln’s Zoo Bar include John Németh Friday, Aug. 2, 5 p.m. Chicago bluesman John Primer, former longtime sideman for Magic Slim, is up Wednesday, Aug. 8, 6-9 p.m. Curtis Salgado hits the Zoo Wednesday, Aug. 15, 6-9 p.m. Anthony Gomes performs Wednesday, Aug. 22, 6-9 p.m. Indigenous plays Friday, Aug. 31, 9 p.m. for a KZUM fundraiser. See zoobar.com. Iconic American songwriter and guitarist Dave Alvin teamed up with acclaimed songwriter and member of The Flatlanders Jimmie Dale Gilmore for a new release early this year, Downey to Lubbock (Yep Roc). The disc explores the artists’ deep roots in blues and country, as they cover songs popularized by Lightnin’ Hopkins, Brownie McGhee, Woody Guthrie and Johnny “Guitar” Watson as well as songs by Steve Young, John Stewart and Chris Gaffney. American Songwriter gave the disc 4 of 5 stars, saying, “An alternatively sweet, touching, rousing and undeniably heartfelt set that plays to both artist’s strengths.” See DaveAlvin.net. Dave Alvin, Jimmie Dale Gilmore and Alvin’s band The Guilty Ones will shine at Sunday Roadhouse at Waiting Room Sunday, Sept 2, 5 p.m. Jon Langford opens the show. It’s a 15th Anniversary celebration for Dean Dobmeier’s and Gary Grobeck’s moveable Sunday Roadhouse concert series. The Sunday Roadhouse also hosts Chuck Prophet at Waiting Room Sunday, Aug. 26, 5 p.m. and presents Lake Street Dive at Slowdown Tuesday, Sept. 4, 8 p.m. See SundayRoadhouse.com for all the details. Texas blues-rocker Hadden Sayers drops a two-disc project in September. One disc, Dopamine Machine, harks back to the guitarist’s sizzling, hard-rocking fret-board fire power. The second, Acoustic Dopamine, takes the same songs and presents them in a stripped-down, acoustic format that let’s Sayers focus on the lyrics in an intimate format. Sayers performs at The B Side in Benson, Wednesday, Aug. 22, 6-9 p.m. in a solo acoustic show to preview Acoustic Dopamine. (Full disclosure, I’ve helped Sayers with strategic planning for the national releases, which drop Sept. 14.) See HaddenSayers.com. In the Market for Blues is Saturday, Aug. 4, offering over 30 bands, from local to international. A $10 wristband gets you into eight venues with music from 2 p.m. to 2 a.m. Performers include the Andy T Band featuring Alabama Mike & Anson Funderburgh, Angel Forrest, IBC 2018 solo-duo winner the remarkable Kevin “B.F.” Burt from Iowa, Dustin Arbuckle & The Damnations along with local artists including Matt Cox, Tim Budig Band and Hector Anchondo Band. Organized by Hector Anchondo and E3 Music Management, check out the full lineup, venues and details at InTheMarketForBlues.com. Josh Hoyer & Soul Colossal have a couple of local shows before they head to Europe for their second European tour. On this trip they will perform over 30 shows in France, Belgium, The Netherlands and Spain. Catch them at Lincoln’s Stransky Park concert series Thursday, Aug. 2, 7 p.m., and at Lincoln’s Blue Blood Brewing Company Friday, Aug. 10, 8 p.m. See JoshHoyer.com. Keep up with local shows all around town at OmahaBlues.com, like the stellar guitar-driven jump-blues of Doug Deming & The Jewel Tones that swings into the B Bar below Castle Barrett Friday, Aug. 10. 5:30 p.m. and Indigenous Thursday, Aug. 30, 8 p.m. at Waiting Room with Sebastian Lane opening.